…you are not alone, particularly among service organizations in the life sciences, such as contract research organizations (CROs), contract manufacturing organizations (CMOs) and labs. The problem of your poor sales performance may be rooted in your marketing, specifically your marketing strategy.The root problem, however, is likely not with your sales organization. The root problem is probably your marketing, specifically your marketing strategy. To understand how to get out of trouble, we first need to take a look at how organizations typically get themselves into it. To assist us, I’ve summarized the typical organizations’ history with a simple mnemonic: Grow, Plateau, hire a Pro, yet still Slow. Let’s examine these phases one by one. In the heady days of starting a firm, there is always too much to do. Long hours are necessary. Gradually the organization is brought into shape, with procedures replacing “seat of the pants” uncoordinated efforts, and written procedures replacing verbal agreements. The prime focus of the firm is keeping current clients happy.When service organizations in the life sciences get started, they often rely too heavily on referrals as the source for new business. Where did these clients come from? In most cases, they came from referrals – from people at the last organization or from a “rolodex” of other industry contacts. And the opportunities these contacts are willing to provide vary widely. To keep the doors open, most entrepreneurs have to take any work that comes along, even if the assignments are not something they’re particularly good at. In the struggle to survive, little attention is paid to the important fundamentals of marketing, i.e., proper positioning. The firm grows primarily through trial and error. There is lots of focus on keeping existing clients happy, even at the expense of margin. As the firm gets established, referrals lead to more clients. But the pace of referrals and the “hit rate” of new client acquisition doesn’t match the desire for new clients. There are several reasons why firms that rely on referrals for new business typically face a trend of diminishing returns; here are the two of the biggest. In many cases, referrals tend to lead not to larger engagements but to smaller, more tactical work. Newer clients haven’t been with your firm as long, and so are not as likely to be as loyal or as heartfelt in their recommendations or as interested in the continued success of the firm as older clients. Firms that are built solely on referrals tend to reach a plateau, because the number and quality of referrals provided by existing clients, or even influential contacts, can’t keep pace with the demands for growth. There are many problems with referrals as a source for new business, including the fact that referrals have trouble satisfying the demand for new clients as the firm grows.The history of taking “any kind of work” soon starts to press against the demand to keep the firm and the growing list of employees stable. Such a generalist approach – “We’ll do anything.” – may seem to widen the number of opportunities that are available, but in fact it actually narrows the percentage of opportunities that the firm has a reasonable chance of successfully winning and completing profitably. This plateau in the growth rate leads firms to search for solutions that will take the firm to the next level. Once the new salesperson is brought on board, there is typically little training and more importantly, little support provided. With so many obstacles, is it any wonder that many business development efforts are doomed to intermittent success at best? Hiring a salesperson will only help if there is a clearly articulated story to tell about the firm’s unique value. Without this clear articulation, most salespeople will start to “freelance” – that is, make up one story after another in search of sales traction. This may help in the short run, but is disastrous in the long run.Let’s say the firm does get lucky, and hires a “good” salesperson, one who can make the most of the available opportunities. This person still faces the fact that buyers are retreating; they can remain anonymous longer, performing their early stage buying activities in private. And the success rates associated with cold-calling have been dropping for years. With a history of doing any type of work, and building the firm through referrals, there has been little or no attention paid to emphasizing the truly unique aspects of the firm. So the salesperson doesn’t have much to go on, do they? In an attempt to cope, salespeople in this situation start to “freelance,” making up the story they tell their clients about their firm’s value, a story that is constantly changing. This is evidence that they aren’t offering anything unique to their prospects. 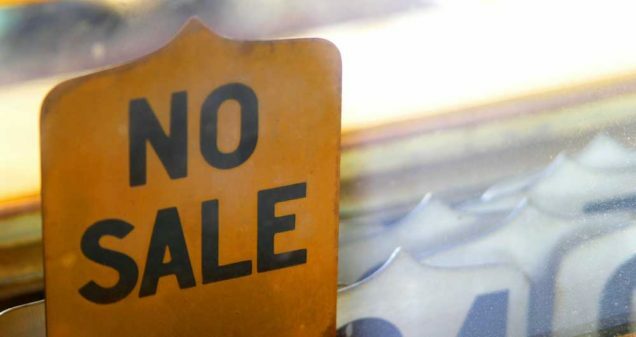 Without unique value, the salesperson will have to close deals based on the relationship –which involves an inordinate amount of time to cultivate – or by providing the lowest price, which reduces your product or services to commodity status. Slow sales traction is often a symptom of poor marketing strategy, that is, it represents the lack of a clearly defined, well articulated and consistently expressed statement of unique value. This problem will manifest itself all throughout the sales funnel.At the top of the funnel, buyers are increasingly doing their preliminary research online. List buying and increased cold calling don’t address this reality: buyers are increasingly doing their comparison shopping anonymously. Without standing out as a unique solution, your organization has little chance of landing on a short list. Buyers won’t “raise their hands” to allow you to start a dialog with them. In the middle of the sales funnel, buyers have stepped out of the shadows of the anonymity afforded by the Internet, and are looking for the best solution to their needs, not just any solution. Again, without a unique offering, you’ll have trouble standing out, or being known for something special. At the bottom of the sales funnel, the presence of unique value drives sales and ensures a higher price. Without unique value, conversations tend to focus on the lowest common denominators – most frequently price. So, predictably, organizational leaders that expected a sales person to solve their growth challenges often are disappointed. But it’s not the sales function that’s the root cause of the lack of sales traction, it’s that sales people can’t sell your wares to customers who haven’t been shown how to properly value them. Unless you give your buyers a valid and compelling reason to see your offering as unique, they will perceive you as a commodity and continue to make their decisions based on price.If your firm looks just like the 27 other CROs, CMOs, labs or other service providers that are persistent enough to scramble for the business, those buyers are going to see you all as basically the same and continue to make their decisions based on price. Because they have no reason to do otherwise. This life cycle is all too common in the service sector of the life sciences: Grow, Plateau, Hire a Pro, Yet Still Slow. While more sales efforts may help, the solution is frequently better marketing strategy, specifically better differentiation and positioning; the results of the identification and promotion of true uniqueness based on the firm’s unique strengths. True differentiation in the life sciences can seem to be difficult to achieve: regulatory oversight monitors both work product and work process. But if you achieve some degree of differentiation, the same forces will act against your competition as a “barrier to entry.”Now, true differentiation can seem to be difficult in the life sciences, with the presence of regulatory oversight that monitors both work processes and work product. And differentiation is difficult to plan, develop and implement by yourself because it’s difficult to read the label from inside the jar. That is: identifying, articulating and expressing your unique value must be done from your audience’s perspective, in terms they understand and value. Many organizations can’t disassociate themselves from their own history or change their perspective sufficiently while making tough strategic decisions. But true differentiation and positioning pays dividends, as the following example makes clear. An example of how life science differentiation and positioning helps the sales process. The CEO of a Top Twenty CRO presented a fascinating case study at an EXL Pharma conference this past summer. Before embarking on a specific effort to differentiate the firm, they were facing a declining backlog and a poor “win” rate when pitching new business. Once a successful differentiation and positioning program was put in place, the backlog started to increase and their “win rate” went up significantly. Ironically, these results were achieved, in part, by saying “no” to more opportunities. The wonderful truth is that saying “no” to inappropriate opportunities allows the firm to focus on those projects for which you are better suited, with a higher chance of winning and completing profitably. The CRO showed that by pursuing fewer projects and focusing only on opportunities they could realistically win, they improved many business measures significantly. If you are having trouble getting sales traction, it may not be solely the fault of your sales efforts. Take a careful look at your marketing strategy and see if you are drawing clear, meaningful distinctions between yourself and your competitors. Here are two quick tests you can use to determine if you have clearly defined the differences between you and your competitors and if your sales staff has internalized these. Visit the home pages of four web sites: yours and your three closest competitors. Copy the text that you find there into a single document, and redact any identifying information, such as brand names, taglines, locations, etc. Ask your salespeople if they can identify the four firms listed. If their answers are equivocal (or just plain wrong), then ask yourself: have we defined our unique value precisely and expressed this position clearly on our web site? If you are having trouble getting sales traction, it may not be solely the fault of your sales efforts. Is your marketing strategy set up to identify, articulate and express clear, meaningful distinctions between yourself and your competitors? If not, how can you hope to compete on anything other than price?Ask your sales staff to write down (individually) what makes your organization unique. This shouldn’t take long – their answers can be simple bullet lists. If you get any of the following answers, discard them from this exercise because they will not allow your customers to distinguish your firm from your competitors: we have the best people, we provide the best service, or anything to do with “quality” (unless they define how quality is measured). Do the answers you receive address the same issues, across your entire sales staff – that is, do you find consistency in the answers? Now ask yourself, could our competitors make the same claims without being laughed out of the room? If you and your competitors are making similar claims, how do you expect your prospects to differentiate between you? And how can you expect to get any sales traction or wield any power over pricing? The solution to poor sales traction in life science service organizations is better positioning. Better positioning, better differentiation and better communication can go a long way towards fixing many common ills among life science organizations and drive the volume of growth and profit that you’re looking for. A typical cycle of growth in life science service organizations is: Grow, Plateau, hire a BD Pro, yet growth is still Slow. At each stage, the failure to pay attention to proper differentiation and positioning only postpones laying the foundation necessary for growth. Referrals, which helped the firm get started, can’t support the desired growth rate. Hiring a salesperson provides limited effectiveness without a compelling story to tell about the firm’s unique value. True differentiation and positioning can seem difficult in the life sciences, because of regulatory oversight and the complexity of identifying, articulating and expressing your unique differentiators. Identifying, articulating and expressing your unique value must be done from your audience’s perspective. Positioning allows you to say no to inappropriate opportunities, while allowing you to focus on those projects for which you are better suited, with a higher chance of winning and completing profitably. There are two simple tests to determine if you have clearly identified, articulated and expressed your unique value. Compare the claims on the home page of your web site with your competitors’ claims. If the claims are redacted of any identifying information (taglines, etc) can your sales staff clearly identify which firms are making each claim? Ask your sales staff what makes your organization unique. Are the answers consistent and differentiated from your competitors? If you and your competitors are making similar claims, how do you expect your prospects to differentiate between you? And how can you expect to get any sales traction or wield any power over pricing?